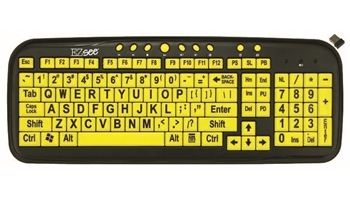 The DataCal EZsee USB wireless large print keyboard provides easy to see computer keys with extra large key legends for greater visibility and efficiency. The included USB dongle allows the EZsee keyboard to connect cable free up to 20' away from your computer. Designed using low profile keys, with the largest legends available on the market. High quality keyboard rated for greater than 10 million keystrokes. Volume pricing and custom printing of your company logo on orders over 100. Two AAA batteries required (not included).